If you look on the list of Most Anticipated Metal Albums of 2013, just about every list contained Trivium. For those who didn’t, they were taken into the dungeon and given 40 lashes with spiked cat-o-nine tails and some actually enjoyed it. For the rest of us, we have been waiting somewhat patiently for Matt Heafy and the guys to unleash another metal masterpiece. They set the bar pretty damn high, some say evening destroying it, with their 2011 highly praised album In Waves. Would they be able to deliver the goods with their new album Vengeance Falls for a legion of metal hungry warriors? There were many who collectively moaned when it was announced that David Draiman (Disturbed/Device) was going to be producing the album. 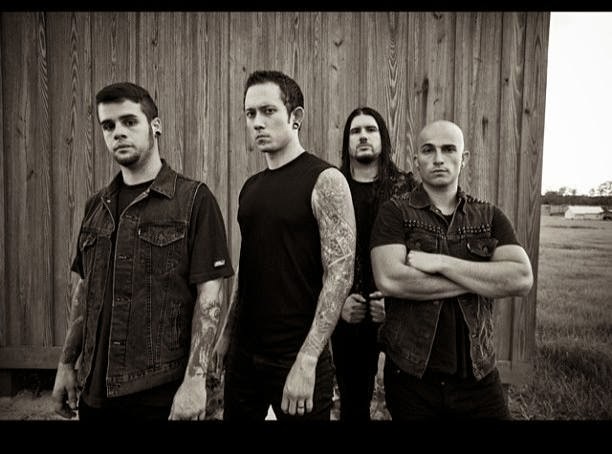 The band’s no stranger to David as their paths have crossed many times including playing on the same bill of the 2011 Rockstar Mayhem Festival. Many wondered what impact that he would have on the band’s sound for this album, while others worried that he may soften up the brutality that the band delivered on In Waves. I, for one, was pleasantly surprised when I first listened to the new album at the results. The album opens with “Brave This Storm” and it slams the accelerator all the way to the floor fast. The flurry of riffs and double kick drum is as if the band is shouting out “We’re back mother fuckers!” and they definitely mean business. This track is definitely a stand out on this very solid album. The lead-off single is “Strife”, to which the band has released a video for, and for the most part it has been met very favorably. Yes, you can hear changes in the band’s ever evolving sound, which is going to be met with some resistance. I think the riffs are more creative throughout the album and are far from being repetitive. I think the biggest thing listeners will notice is Matt’s vocal delivery. He’s raised his own personal bar by growing and relying less on his screaming/growling delivery and developing a more, somewhat melodic delivery showing much more depth. This will probably upset the purists who want him to stay the same, but I tip my metal hat to him for showing growth as an artist. “At The End of This War” begins with a somber acoustic intro and as Matt begins to sing, you scratch your hand wondering if this is going to be a ballad of some sorts. Well, a mere 45 seconds into it sees the band quickly change gears and start cranking out the riffs. This is yet another stand-out track on many levels. It’s really hard to listen to this album and immediately think, ‘oh yeah, this is a filler track’, because it’s very solid from beginning to end. Overall, I think it’s a step up from In Waves because if their growth that’s shown throughout. It’s definitely intense and powerful and loaded full of amazing riffs. If you came in wanting it to sound like earlier, pre-In Waves Trivium, then you will be disappointed. If you are expecting In Waves Part 2, then you will be less disappointed. I hope people will have an open mind before they even put this album on for a listen. Judge it for the work of art it is and don’t compare it to past albums. Crank this new album to 11 and let the air guitar playing begin!